Cytological examination of body fluid is useful to detect malignancy, but a definitive diagnosis cannot always be made on cytologic evaluation alone when it is admixed with reactive mesothelial cells or mesothelioma where the cells mimic adenocarcinoma (AC) cells. Mesothelial cells because of the wide variety of stimuli and injuries that break their continuity show reactive changes such as proliferation and cellular changes including marked nuclear and cytoplasmic alterations that can mimic the morphology of malignant cells., Thus, atypical reactive mesothelial cells serve as a major pitfall for a false positive diagnosis of malignancy. In treated cancer patients, effusion often represents the first manifestation of recurrent disease. Sometimes, low-grade carcinoma can masquerade as benign ones. Benign mesothelium undergoes myriad architectural, and cellular alterations in reaction to numerous stimuli, while, well differentiated or borderline malignant cells can masquerade as benign ones. Hence, it is important to identify malignant cells in effusion samples for therapeutic and prognostic purpose. In such cases, ancillary diagnostic techniques are needed to solve the dispute. Immunocytochemistry (ICC) analysis is one such easily performed technique and uses a panel of markers.,,,,,,,,,,,, However, there is a huge lacuna in achieving an accurate panel of immunomarkers as a diagnostic aid in solving the problems. Several antibodies have been tried in the differentiation of reactive mesothelial (RM) cells from metastatic ACs; unfortunately, no single marker is so far 100% specific and sensitive for neither AC cells nor RM cells.,,,,,,,,,,,,,, Hence, the present study evaluated the efficacy of four markers that include MOC-31, epithelial membrane antigen (EMA), calretinin (CAL), and mesothelin (MES) to differentiate AC cells from RM cells in serous effusions. Forty-two cases suspected of malignant effusions of pleural and peritoneal fluid and positive for malignant cells on cytomorphology over a period of one year were included in the study. Forty-two reactive effusion cases were included as control samples. Cytologically, effusion with inflammatory cells without mesothelial cells or malignant cells were excluded. In all cases, cytospin smears were prepared using Shandon Cytospin-3 technique. Cytoslides, filter card, and cytofunnels were assembled in the cytoclip, and cytoclip was fitted into the Shandon machine. Then, 0.5 ml of fluid was added into the funnel, and machine was run for 10 min at 2000 rpm. Minimum of two slides were prepared and stained with Giemsa for morphological diagnosis. Extra four smears were prepared wherever possible for ICC. The extra smears were wrapped in aluminium foil and preserved at 0°C in refrigerator for ICC. The cell blocks (CBs) were prepared where the adequate samples were available by using Thermo Shandon cell block kit. ICC was performed on 18 cases taken as CB sections, 12 cases as fresh smears, and 12 cases as both smears and CB sections. Among the control cases, ICC was done on 28 cases as smears, 8 cases as CBs, and 6 cases as both CBs and smears. Primary antibodies used were EMA (mouse monoclonal antibody GP 1.4, DBS), MOC-31 (MOC-31, Bio SB), CAL (DAK-Calret 1, Dako), and MES (HBME1, Dako). BioGenex Super Sensitive Polymer-HRP Detection System-a biotin free detection system was used in conjunction with rabbit/mouse IgG primary antibodies. Diaminobenzidine as a substrate for peroxidise, which was used as an enzyme label. Citrate buffer was freshly prepared each time and used for antigen retrieval. Positive and negative controls for all the antibodies were run each time. Smears were fixed in a mixture of acetone and methanol (50:50) (20°C) for 5 min. The two authors independently evaluated the slides. Staining in more than 20% of cells was considered as significant staining and positive. Statistical analysis was done using Chi-square test and Fisher's exact test using SPSS software version 16. Among the 42 AC cases, 30 (71.43%) cases showed definitive evidence of malignancy, and 12 (28.57%) cases were given as suspicious for malignancy. Sensitivity (Sn) for definitive diagnosis of AC according to cytomorphology alone was 71.43%. Out of 42 cases, 15 cases were pleural effusion, and 27 cases were peritoneal effusion. Primary site of carcinoma were ovary (29 cases), lung (7 cases), gastrointestinal tract (4 cases), pancreas, and unknown primary (1 case each). All the cases were proven malignancy by histopathology, where in the unknown primary on further evaluation was found out to be colonic AC. We did not encounter any case of mesothelioma. Definitive adenocarcinomatous cases, cytologically were seen as cells arranged in large cellular aggregates, papillary clusters, acinar pattern [[Figure 1]a, a-inset], and signet ring cells. In 12 cases, definitive morphological diagnosis was not possible; in these cases, atypical cells were seen scattered with nuclear atypia, signet ring cells along with RM cells. All the cases on ICC confirmed malignancy. Among control cases, RM cells were seen as papillary forms, sheets, and scattered cells with binucleation [[Figure 1]b, b-inset]. All theses cases had mixed inflammatory infiltrate in the background. The results of ICC are shown in [Table 1] and [Table 2]. MOC-31 was expressed in 100% of all the AC cases including the suspicious cases, out of which 35 (83.33%) cases showed strong membranous pattern, while 7 (16.67%) cases exhibited membranous accentuation with cytoplasmic staining [Figure 2]a. In RM cells, MOC-31 was expressed in 2 (4.8%) cases both of them showed weak cytoplasmic staining pattern. EMA was expressed in 37 (88%) of 42 AC cases. In 33 cases, it showed strong membranous accentuation pattern [Figure 2]b, while in 4 cases there was strong cytoplasmic staining with membranous accentuation. Among the 42 reactive cases, it showed weak membranous staining in 3 (7.1%) cases. In all RM cases, CAL showed 100% Sensitivity (Sn) with nuclear and cytoplasmic staining pattern or nuclear staining pattern [Figure 2]c. Among the 42 AC cases, one case (2.4%) showed weak cytoplasmic staining. MES showed strong membranous staining in 41 (97.6%) of 42 RM cases [Figure 2]d; while in AC cases, it was expressed in 5 (11.9%) cases. Out of these 5 AC cases, 4 cases showed strong cytoplasmic staining pattern, one case showed focal membranous staining pattern. Thus, MOC-31 was the overall single best marker for the AC cells, exhibiting 100% Sn and Sp (95.24% Sp). EMA also exhibited high Sn and Sp, but slightly on lower side compared to MOC-31. Among the RM group, CAL had 100% Sn and 97.62% Sp. MES also had high Sn of 97.62%, but its low Sp (88.10%)limits its use as a sole mesothelial marker. 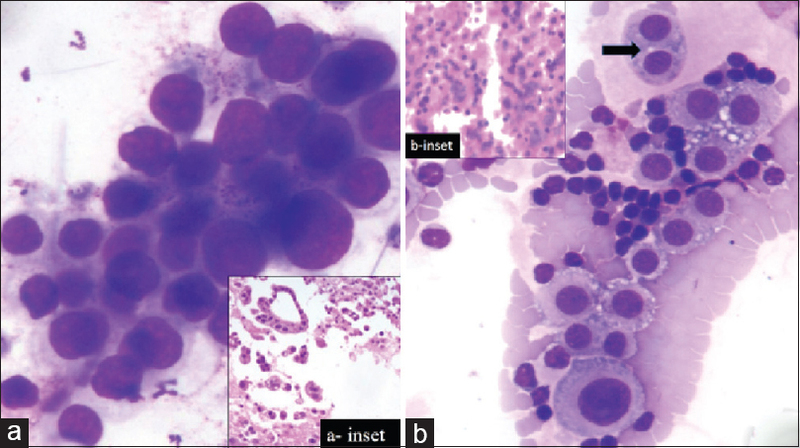 CB is a simple technique and has been shown to be useful adjunct to centrifuged samples of effusion smears for a more definitive cytological diagnosis, particularly where morphology is not possible with smears alone. Sections from the CB showed optimum morphology that was almost parallel to histopathology in some cases. Not only does CB preserved cellular architecture, but it can also be used for special stains and immunohistochemistry. Additionally, unlike smears, CBs can be preserved for a longer period of time without losing the antigenic properties of the cells. Thus, sections from CB could supplement cytospin smears for ICC and definitive diagnosis in equivocal cases. The present study analyzed both CB preparations and cytospin preparations for immunostaining and found both types of preparations to be comparable with regard to the quality of immunoreactivity. In recent years, ICC analysis has contributed greatly to differentiate between AC and mesothelial cells. Most of the available markers, such as carcinoembryonic antigen (CEA), CD15 (Leu M1), BerEP4, and B72.3, recognize molecules commonly expressed by ACs but not by mesothelial cells.,,,,, However, the expression of these markers were not uniform among different types of ACs and also not diagnostic of primary site of origin. In our study, MOC-31 showed strong membranous staining in all AC cases including the suspected ones, where in tumor cells showed intense staining with negative mesothelial markers. In the present study, two cases (4.8%) of RM cells expressed focal cytoplasmic staining; however, typical membranous accentuation was not seen as compared to the AC cells. Kundu et al., Lozano et al., and Hecht et al. also found MOC-31 expression in RM cells. Although EMA also showed strong membranous or cytoplasmic with membranous accentuation staining in AC cells, EMA was also expressed in few RM cells, with weak membranous staining pattern. This result is comparable with findings from other studies done earlier that also observed weak expression of EMA in normal or RM cells and strong expression in mesothelioma.,,, Because of this difficulty in interpretation of staining patterns, we conclude MOC-31 is preferred over EMA for AC cases. Moreover, our study included variety of primary sites and all cases expressed same intensity. In the present study, MES was expressed in all except one RM cases with strong membranous staining pattern with Sn of 97.62%. Among AC cases, 5 cases expressed this antibody, which included ovarian AC (3), lung, and pancreatic AC (1 case each). Ordonez et al. and Yaziji et al. found apart from mesothelial cells this antibody was also expressed in ovary, pancreas, and lung ACs. However, the staining pattern differs between these two; strong membranous pattern favors RM cells, cytoplasmic, mixed cytoplasmic, membranous, and focal membranous staining pattern favors AC. Among the 12 suspicious for malignant effusion cases, both MOC-31 and EMA showed 100% Sn, whereas CAL was negative in the same cell clusters. The background RM cells stained positive for CAL. However, in one case (primary site ovary) MES stained RM cells as well as suspicious AC cells, but the staining pattern differed in these two cell types. During our one year study period, we did not come across any case of mesothelioma. However, the differentiation between RM cells and mesothelioma would be according to the cytological features as the existing mesothelial markers are helpful in identifying whether the cell is of mesothelial origin, rather than differentiate RM cells from cells of malignant mesothelioma. Until now, no single marker is capable of differentiating RM cells from AC cells. The present study also favors a panel of antibodies to arrive a definitive diagnosis as inferred by others. Thus, we conclude ICC markers MOC-31 and CAL as a limited panel will be helpful in differentiating AC cells from RM cells in cytologically difficult cases. It can be performed both on cytospin smears as well as on CBs, with similar intensity in results, where in by smear technique would be easy and time saving. The authors thank all the technical persons in the department of pathology, Maulana Azad Medical College for their support. Motherby H, Nadjari B, Friegel P. Diagnostic accuracy of effusion cytology. Diagn Cytopathol 1999; 20:350-7. Mohanty SK, Dey P. Serous effusions: Diagnosis of malignancy beyond cytomorphology. An analytic review. Postgrad Med J 2003; 37:569-74. Pereira TC, Saad RS, Liu Y, Silverman JF. The diagnosis of malignancy in effusion cytology: A pattern recognition approach. Adv Anat Pathol 2006;13:174-84. Murugan P, Siddaraju N, Habeebullah S, Basu D. Immunocytochemical distinction between mesothelial and adenocarcinoma cells in serous effusions: A combination panel-based approach with a brief review of the literature. Indian J Pathol Microbiol 2009;52:175-81. Kundu UR, Krishnamurthy S. Use of the Monoclonal Antibody MOC-31 as an immunomarker for detecting metastatic Adenocarcinoma in Effusion Cytology. Cancer Cytopathol 2011;119:272-8. Lozano MD, Panizo A, Toledo GR, Sola JJ, Pardo-Mindan J. Immunocytochemistry in the differential diagnosis of serous effusions: A comparative evaluation of eight monoclonal antibodies in Papanicolaou stained smears. Cancer 2001;93:68-72. 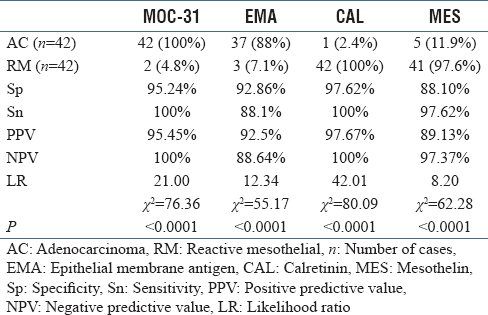 Saleh HA, El-Fakharany M, Makki H, Kadhim A, Masood S. Differentiating reactive mesothelial cells from metastatic adenocarcinoma in serous effusions: The utility of immunocytochemical panel in the differential diagnosis. Diagn Cytopathol 2009;37:324-32. Politi E, Kandaraki C, Apostolopoulou C, Kyritsi T, Koutselini H. Immunocytochemical panel for distinguishing between carcinoma and reactive mesothelial cells in body cavity fluids. Diagn Cytopathol 2005;32:151-5. Lee JS, Nam JH, Lee MC, Park CS, Juhng SW. Immunohistochemical panel for distinguishing between carcinoma and reactive mesothelial cells in serous effusions. Acta Cytol 1996;40:631-6. Chhieng DC, Yee H, Schaefer D, Cangiarella JF, Jagirdar J, Chiriboga LA, et al. Calretinin staining pattern aids in the differentiation of mesothelioma from adenocarcinoma in serous effusions. Cancer Cytopathol 2000;90:194-200. Arora R, Agarwal S, Sandeep RM, Verma K, Iyer VK, Arora M. Utility of a limited panel of calretinin and Ber-EP4 immunocytochemistry on cytospin preparation of serous effusions: A cost-effective measure in resource-limited settings. Cyto Journal 2011;8:14. Ko EC, Jhala NC, Shultz JJ, Chhieng DC. Use of a panel of markers in the differential diagnosis of adenocarcinoma and reactive mesothelial cells in fluid cytology. Am J Clin Pathol 2001;116:709-15. Brockstedt U, Gulyas M, Dobra K, Dejmek A, Hjerpe A. An optimised battery of eight antibodies that can distinguish most cases of epithelial mesothelioma from adenocarcinoma. Am J Clin Pathol 2000;114:203-9. He DN, Zhu HS, Zhang KH, Jin WJ, Zhu WM, Li N, et al. E-cadherin and calretinin as immunocytochemical markers to differentiate malignant from benign serous effusions. World J Gastroenterol 2004;10:2406-8. Wieczorek TJ, Krane JF. Diagnostic utility of calretinin immunohistochemistry in cytologic cell block preparations. Cancer 2000;90:312-9. Ordonez NG. Value of mesothelin immunostaining in the diagnosis of mesothelioma. Mod Pathol 2003;16:192-7. Hecht JL, Pinkus JL, Pinkus GS. 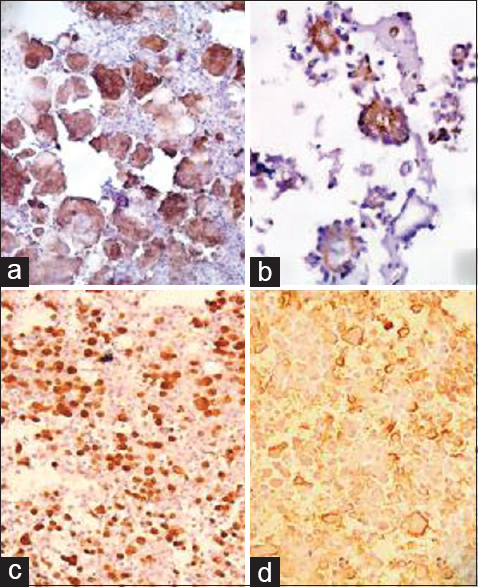 Monoclonal antibody MOC-31 reactivity as a marker for adenocarcinoma in cytologic preparations. Cancer Cytopathol 2006;108:56-9. Yaziji H, Battifora H, Barry TS, Hwang HC, Bacchi CE, McIntosh MW, et al. Evaluation of 12 antibodies for distinguishing epithelioid mesothelioma from adenocarcinoma: Identification of a three-antibody immunocytochemical panel with maximal sensitivity and specificity. Mod Pathol 2006;19:514-23. Nathan NA, Narayan E, Smith MM, Horn MJ. Cell block cytology improved preparation and its efficacy in diagnostic cytology. Am J Clin Pathol 2000;114:599-606. Sloane JP, Ormerod MG. Distribution of epithelial membrane antigen in normal and neoplastic tissues and its value in diagnostic tumour pathology. Cancer 1981;47:1786-95. To A, Coleman DV, Dearnaley DP, Ormerod MG, Steele K, Neville AM. Use of antisera to epithelial membrane antigen for the cytodiagnosis of malignancy in serous effusions. J Clin Pathol 1981;34:1326-32.